Creating a natural privacy fence with trees and shrubs. Designing, building, and installing a new fence is a big job. And it can completely change the look and feel of your property—so you want to make sure you’re making the right choices during the planning phase. A great option that many people don’t consider is using plant life to create a natural barrier instead of using wooden planks or metal bars. While creating a natural fence can initially take patience and careful consideration, the rewards are worth it. Before getting started, it’s important to decide why you want a fence in the first place. If you’re using the fence to restrict your pet, or you want a fence for security purposes, natural barriers probably aren’t the best choice for you. But if you’re looking for something unique with lots of curb appeal—and serves as an excellent sight, sound, and wind barrier—a natural fence might be just what you’re looking for. 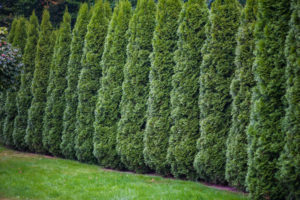 These types of fences can be created using a huge range of plant material—everything from evergreen trees to boxwoods to Arborvitae. If you want a tall natural fence, coniferous trees are a great choice because they keep their needles year-round as opposed to deciduous trees that lose their leaves in the winter. It’s also usually best to use plants that are safe to touch—rose bushes aren’t a great idea because of their thorns, for example. If you’re on the proverbial fence about a natural barrier, keep in mind that you can also do a hybrid option, building a structure for plants to grow on. (Think ivy with a trellis or chain-link fence.) This can be a good option for some people, but remember that you’re increasing your maintenance work since you’ll have to care for plants while also keeping an eye out for repairs. It’s important not to underestimate the scope of a natural fence project if you decide to go that route. Unlike a regular fence, the job isn’t over once everything is in the ground—some of the most beautiful natural fences take years to reach their full potential. But the time and effort put into these types of projects truly pays off. If you’re interested in creating your own natural fence, we’d love to help. We’ve taken on many natural fence projects over the years. Contact us today to see what we can do for you. This entry was posted in At Home, Estates, Green Scene and tagged Featured by Eric Engledow. Bookmark this link.